To the President and Directorate of Hyperial, Greetings. This is a formal announcement that Squad FluxGuts will begin the process of moving their primary sphere of operations to Hyperial space for the duration of the current Conflux aggression towards Hyperial. We, of course, will only concern ourselves with combating the Conflux while in your territory; as has long been my policy – whatever the Conflux want – they can’t have. Right now, that seems to be a blockade of Hyperial space. That is what we aim to deny them. I believe you know of me, and my squad – we recently put on a bit of a pyrotechnics display in honor of my old squadmate, samwise. As you read, that Fluxhunt was to focus on clearing the space lanes surrounding the bottleneck to your factional territory. This new move is phase 2 of our response to their recent incursions. My squadmate, Sinver, has been based in your territory for some time – but we’re preparing to base our entire squad’s active operations in Hyperial, instead of Amananth, as New Dawn did. I have an ulterior motive for this, but as I said, I wish to make a show of good faith by actually keeping to the terms of The Reconstruction Initiative, and keeping your space lanes safe, since you do not have a space capability of your own at present, due to pressures brought to bear by certain elements. I’m not prepared to argue the merits of that decision at this time – but believe me when I say that I have no animus towards Hyperial, and am concerned only with the safety of your sectors, and that of the pilots who come there to trade. If you are willing, we are prepared to move the venerable Conflux War Command Center, which I have recently unsealed and returned to service, to Hyperial Station. I will, of course, await your pleasure, and the authorization of your Station Governor before making such a move, however. Once our bona fides are sufficiently established, perhaps we can then discuss some matters of mutual benefit. In the meantime, I hope that our actions demonstrate our friendship to Hypsos, and her people. That’s certainly something we didn’t see coming! From the wording of the note, it seems to specifically deny any inter-factional military support – but the curious sections concerning an “ulterior motive” and “matters of mutual benefit” suggest that there is more going on here than meets the eye. The offer to actually move the CWCC from Amananth is quite a break with tradition, to say the least. We’ll be watching to see what response, if any, Hyperial makes to this announcement. This is obviously and attemp of the hyperian government to recruit mercenaries and build up an army. If so, we cannot accept this unspeakable betrayal to the octavian empire and the emperor by pilot Razorkiss and his disgusting mix squad of so called flux hunters. The octavian Battle Divison (=BD=) will observe this efforts and will decide how to handle with pilots of FluxGuts. Since we’re “so-called” Fluxhunters, I’m sure you’ll be happy to show us how it’s done. I’ll be waiting, with interest, to see how many flux and swarms you kill in the next week – or whether you even make it into space once. This should be fascinating, for us all. Who are you, and which head were you dropped on as a child? We’re fluxhunters. 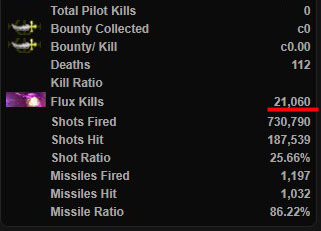 There’s nothing “so-called” about 40,000+ flux kills – or the fact that we just sponsored a massive fluxhunt in honor of a former New Dawn squad member, or that I’m the ex-commander of New Dawn…. you know, New Dawn? The dedicated Fluxhunters? The same ones I helped found, lead, and all that? Need I go on, or are you falling on your other head at the moment? We were the ones who reported the flux buildup around Hyperial, and between Sol and Quantar. We were the ones who updated the fluxmap. I kill at least 4 swarms a week. When there’s an infest, and we’re in space, we’re there. We were the ones who _volunteered_ to kill Flux around Hyperial – because whatever the Flux want, they can’t have. We’re not getting paid a thing. Again, are you dense, or just terminally stupid? I have no idea who =BD= is, and I don’t care. It’s not like you’ve been in space for months, is it? Go shoot at flux if you want to do something useful, meathead. We do not care about names. If the hyperian government thinks it can cut off octavian trade routes and critical ressources from the empire by hiring mercenaries to take control of specific sector it is a threat that we will take care of. Remember, its just the dirty edge of the glorius octavian empire. A) Not hired B) Not mercenaries C) I can tell you don’t care about names, given the one you have D) Not controlling sectors, don’t care about either your petty factionalism or Hyperial’s. Or Solrain’s, or Quantar’s… Get the idea yet? D) we’re doing the opposite of cutting trade routes, moron. We’re keeping them open. If you’d been in space at any time in the last month, you’d know that. I know it’s hard for factionalists to rub brain cells together sometimes, but try here, for a minute. We kill flux because they’re the real threat. Idiocy like your posturing here is what has brought TRI to the brink of extinction for two decades. We have no desire to do anything for hyperial’s interests save kill flux and keep the trade routes open under the current elevated threat levels of Conflux blockade. I go where the flux are. Where are you? Yammering on a news site while real pilots fight the real war. Again, go kill flux if we’re only “so called” fluxhunters. I’m sure you’ll have 40000 yourself in no time, with no effort. If he would be as intelligent and factionalist as he has an big mouth, I would already had to pay the bounty out that I priced out. But seems he can’t even get his factionalism right. Or he would have been one of the first jumping on a bounty to hunt an Mercenary/military tagged Quant that violates faction beacons for said bounty. An Bounty that even brought Quants to say they want to earn it. For that reason RazorsKiss I advice to not further communicate with the brick head as he clearly had to much Octavian beer and is unable to get a clear head. Keep the good work up for the traders that keep the Econ running for the benefit of all Pilots and ignore extremists that cover this nearly Pie-RAT behaviour behind so called factionalism. Sounds more like Balrog or BlackHand talk then an Oct loving his faction and be willed to defend the borders of his faction or secure the safety of Octavian civilian Pilots. We do have reports that pilot Sinver is transporting equipment to towards hyperial space in a Tow. If the hyperian government thinks, it can arm up this way, it’s wrong. We will take action if needed to keep control over all critical sectors. Be warned that collaboration is punished with shut down. Care to show us how we’re so-called fluxhunters yet? You do know that we’re at peace with Hyperial – right? That I’m an Optimus, and you aren’t – right? That I fly, and you don’t – right? We’re at peace with both Solrain and Hyperial – so I return to my original question – which head were you dropped on as a child? I’m using pictures, so you can understand. Words are hard apparently. Sinver’s killed 21,000 flux as an elaborate ruse, obviously. 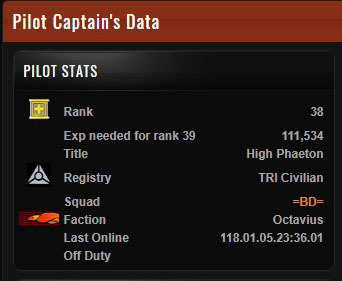 Next, he’ll go get 200 pilot kills as an elaborate ruse to disguise the fact that he’s a fluxhunter. Truly, you have a dizzying intellect. In other news, Captain bugged out of Amananth about a minute before the Aman Leap infest was destroyed, and the Conflux counterattacked. When asked to come fight, he said "why should I fight Amananthi battles?" Great Warrior, this'un. If you like useless blowhards, that is. Have to admit, guys. I did turrible at Amananth today. Off day like you wouldn't believe. You win some, you lose some – I just really hate losing. Of course, getting distracted by TTeleOct didn't help, either – but that's part of the deal. But seriously – why -was- an Oct isolationist at Amananth? Why did he jet out not even a minute before sents attacked Amananth? If he was supposedly "checking out" FluxGuts in Hyp – why was he off duty again in less than 5 minutes after leaving Amananth? Something's fishy.